pravin gordhan Archives - Africa M.E. South Africa economic confidence to get a lift after cabinet reshuffle. 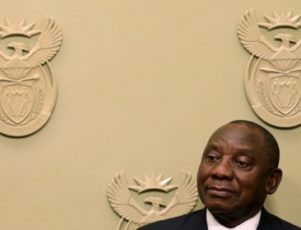 JOHANNESBURG (Reuters) – Confidence in South Africa’s economy will get a boost after Monday’s cabinet reshuffle by President Cyril Ramaphosa returned trusted hands to crucial budget-related ministries, a Reuters poll showed on Thursday. Seventeen of the 20 economists surveyed in the past three days said Monday’s reshuffle would have a significant positive impact on South Africa’s economic confidence this year. One economist said it would be very significant, while the remaining two said it would have an insignificant impact. In that same sample, 18 indicated they were optimistic the country’s business sector would play a bigger part in job creation in the next two years. One economist was very optimistic while the remaining one was pessimistic. “Both business and consumer confidence is likely to be boosted by the election of Cyril Ramaphosa to President of the Republic and the cabinet reshuffle that (followed),” said Jeffrey Schultz, economist at BNP Paribas in Johannesburg. South Africa’s business confidence rose for a third month in a row in January to its highest since late 2015, on expectations the new leadership of the ruling party would stabilise economic policy, a survey showed last month. “President Ramaphosa clearly has his sights set on improving the domestic business climate and promoting more public-private sector participation,” said Schultz. Gross domestic fixed investment – normally capital spending, such as buying new machinery for future production – fell into a recession in 2016, recovering only slightly early last year before hitting another slump in the second quarter. The private sector makes up nearly two-thirds of the gross domestic fixed investment contribution to GDP, although it has played a smaller role in recent years, with government pushing infrastructure projects to raise jobs. Schultz added that it would take some time for the trust between business and the government to be rebuilt, but it was clear the new government has realised it needs business sector buy-in to get growth and reduce unemployment. 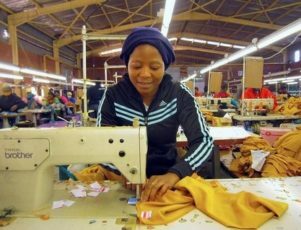 Unemployment was at just over 20 percent a decade ago and now more than a quarter of South Africa’s labour force is jobless. Ramaphosa appointed Nhlanhla Nene as finance minister on Monday and Pravin Gordhan as public enterprise minister. All but one of the 20 economists polled singled out these two National Executive appointments as most likely to inspire economic confidence. Both Nene and Gordhan served as finance ministers in the last administration but were unceremoniously sacked by former President Jacob Zuma. Moody’s is due to publish a review later this month, which economists said in February would offer the country a reprieve. JOHANNESBURG, June 5 (Reuters) – Private-sector activity in South Africa was little changed in May from April, remaining in positive territory, as new orders and output failed to register significant gains. The Standard Bank Purchasing Managers’ Index (PMI), compiled by Markit, was at 50.2 in May compared with 50.3 in April, still above the 50 mark that separates growth from contraction. “PMI remained above 50 for the ninth month running in May, signalling the longest sequence of overall improvement in operating conditions in five years,” Markit said in a statement. The sub-index for new orders fell to 50.1 in May from 50.4 previously. Output rose slightly to 49.9 from 49.6. South Africa’s economic outlook has been clouded by credit rating downgrades to “junk” by two of the three major rating agencies after President Jacob Zuma fired Finance Minister Pravin Gordhan in late March. A fall below investment-grade typically constricts funding and sharply raises borrowing costs. JOHANNESBURG (Reuters) – The governor of the South African Reserve Bank said on Tuesday that although the decision by Britain to exit the European Union would not cause a recession, already slowing economic growth would be hit. Finance Minister Pravin Gordhan said on Sunday financial market volatility caused by Britain’s decision to quit the EU, which sent the rand tumbling, could hurt investment flows into South Africa. Britain voted last week in a referendum to leave the EU, wiping billions of dollars off world equity markets. “It has affected sentiment and investors were looking for safe assets. 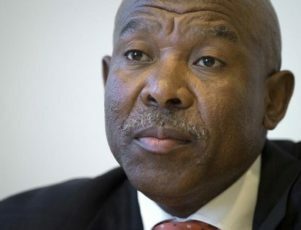 We are not seen as one of the safe assets,” Kganyago said. South Africa’s economy is barely growing, hobbled by power cuts last year, low commodity prices, drought and political ructions that have unnerved investors. Africa’s most advanced economy contracted in the first quarter, putting it on track for its first recession in seven years. JOHANNESBURG (Reuters) – South Africa has robust institutions to help it avert a credit downgrade, Finance Minister Pravin Gordhan said on Friday, days after Fitch became the third major rating agency to uphold its investment grade status. But he said that South Africa’s government must stick to its fiscal targets in the next five months and could not risk any pressure on the budget from debt-ridden state firms. South Africa has also dodged cuts from Moody’s and S&P, but analysts said that downgrades could be in the pipeline by December amid an economic meltdown critics partly blame on mismanagement by President Jacob Zuma. Speaking at a business forum, Gordhan said he had nothing to hide or worry about in relation to an investigation into a surveillance unit formed at the South African Revenue Service (SARS)‚ when he was its commissioner between 1999 and 2009. “Confidence plays a big part in whether we get investments going and business activity going in our country,” Gordhan said at online publication Daily Maverick’s “The Gathering”, a forum also addressed by a cross-section of political leaders. Zuma rattled investors in December by changing finance minister twice in less than a week, triggering a run on the rand and bonds. To calm markets, the president reappointed Gordhan to the post he held from 2009 to 2014. An investigation by the elite police unit Hawks into the surveillance unit at SARS has however led to speculation that Gordhan does not enjoy Zuma’s political support. On Friday Gordhan said Zuma and the ruling African National Congress had issued statements assuring him and the National Treasury of their support, but hinted that it would not be easy to rebuild dented confidence in South Africa. Gordhan’s comments did little to cheer the rand, which fell more than 2.1 percent against the dollar on Friday in what traders and analysts said was partly a correction after rallying to five week highs following the Fitch review. Gordhan stressed the need to put policies in place that would support sectors like mining and boost the economy, which Treasury estimates would grow at most by 0.9 percent in 2016. Data from the statistics agency this week showed GDP contracted by 1.2 percent in the first quarter, mainly due to an 18-percent slide in mining during the quarter. “We need to stabilise sectors of the economy that find themselves in trouble, like mining,” Gordhan said. 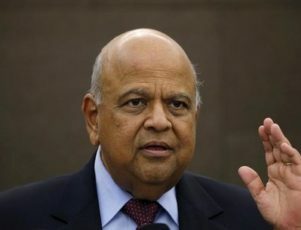 JOHANNESBURG (Reuters) – South Africa’s rand strengthened early on Monday after the police said they had no plans to arrest Finance Minister Pravin Gordhan over his role in the formation of a surveillance unit within the revenue service. At 0700 GMT the rand had edged 0.2 percent firmer to 15.6050 per dollar. Bonds were also firmer in early trade, with the yield on the benchmark government issue due in 2026 cutting 6 basis points to 9.33 percent. The elite Hawks police unit told Reuters it had no plans to arrest Gordhan as part of an investigation into a surveillance unit set up by the revenue service during his time in charge. Gordhan headed the tax agency between 1999 to 2009. Numerous political upheavals since President Jacob Zuma’s shock sacking of then Finance Minister Nhlanhla Nene in December have seen the rand suffer. Traders said the rand would benefit if political tensions around the finance minister eased. 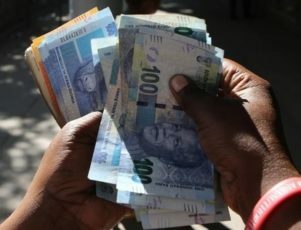 “The rand has rebounded somewhat since hitting all-time lows in thin liquidity during mid-January, aided by hawkish action from the SARB (South African Reserve Bank) and generally calmer emerging markets,” analysts at NKC Africa Economics said in a note. The rand has gained more than 1.5 percent against the greenback since slipping to a new one-month low after last weeks decision by the central bank to keep lending rates unchanged at 7 percent. Stocks opened weaker, with the benchmark Top-40 index shedding 0.38 percent to 46,356 points by 0708 GMT. JOHANNESBURG (Reuters) – South Africa has successfully issued a dollar bond overseas to help finance its medium-term foreign currency commitments, the Treasury said on Friday, touting this as a sign of investor confidence despite political upheaval. Finance Minister Pravin Gordhan has been anxious to reassure investors about continuity in fiscal policy after President Jacob Zuma changed finance ministers twice in less than a week in December, triggering a panic run on the rand. On Friday, the Treasury said its $1.25 billion 10-year bond, with a coupon of 4.875 percent, had been more than two times oversubscribed, mostly by investors based in Europe and the United States. “The South African government sees the success of the transaction as an expression of investor confidence in the country’s sound macro-economic policy framework and prudent fiscal management,” it said. Zuma, who has been dogged by controversy over the past decade, is under mounting pressure to quit after the Constitutional Court found he flouted the law by not heeding a directive to make payments for upgrades to his personal home. Ratings agencies, most recently Standard & Poor’s, have warned they might downgrade South Africa if political issues divert the government’s attention from properly implementing policy. S&P and Fitch both rate South African credit just one notch above junk, while Moody’s is two notches over sub-investment grade. Analysts said South Africa had benefited from a general rise in demand for high-yielding emerging market assets after the U.S. Federal Open Market Committee (FOMC) signalled it might be a while before U.S. rates rise. “There was clearly a window here for them to issue after the FOMC reprice and before a wall of downgrades from the ratings agencies,” Nomura analyst Peter Attard Montalto said. The rand extended gains against the dollar after the Treasury’s statement, climbing to a session high of 15.0155, up 1.5 percent for Thursday’s close. Government bond prices also rose, sending the yield on the benchmark bond due in 2026 down 8.5 basis points to 9.19 percent. The Treasury said the new foreign bond formed part of South Africa’s 2016/17 financing programme and would partly finance foreign currency commitments of $6.4 billion over the medium term. The coupon for the bond represents a spread of 335 basis points (bps) above the 10-year U.S. Treasury benchmark, which analysts said was in line with South Africa’s current funding rate. “I don’t think it’s too expensive,” said Rand Merchant Bank trader Gordon Kerr. The price compares to initial thoughts of plus 350 bps and guidance of plus 335 bps, plus or minus 5 bps. “There is always demand for our paper and there will always be demand for EM in general because of the nice yields that it provides,” Rand Merchant Bank trader Gordon Kerr said. JOHANNESBURG (Reuters) – South African assets remained in favour on Tuesday with local markets extending the previous session’s rally after Pravin Gordhan was named as finance minister, which stemmed last week’s sell-off. The rand firmed to well below the 15 mark against the dollar, while banking stocks climbed again after surging almost 9 percent on Monday. By 1500 GMT, the rand had gained 0.9 percent to 14.9595 per dollar, just off its firmest since Nhlanhla Nene was unexpectedly axed as finance minister by President Jacob Zuma last Wednesday, a move that triggered a market meltdown. 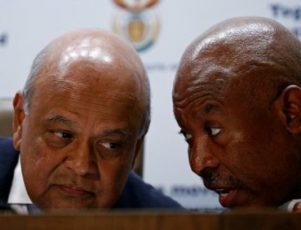 Investors were deeply troubled by Zuma’s appointment of the untested David van Rooyen to the crucial Treasury post, forcing an abrupt U-turn on Sunday when the president gave the job to Gordhan, who was finance minister from 2009 to 2014. The rand also benefited from greenback selling as local traders sought to unwind long-dollar positions ahead of a meeting of the U.S. Federal Reserve, whose policy committee (FOMC) is expected to raise interest rates on Wednesday. “The local markets definitely don’t want to run the massive risks over the holiday and the FOMC, so we’re seeing large profit-taking from long-dollar positions today,” said the chief trader at Bidvest Bank’s currency desk, Ion de Vleeschauwer. South African markets will be closed on Wednesday for a public holiday. 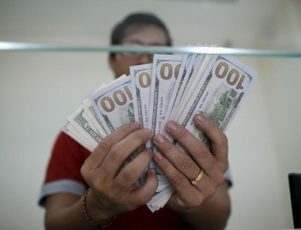 The dollar slipped to a seven-week low against a basket of currencies on Tuesday amid growing jitters over the message the Fed will seek to send on interest rates on Wednesday, buoying most emerging market currencies. South African government bond yields fell across the curve on Tuesday, extending the previous session’s rally. At 1500 GMT, the yield on the benchmark paper due in 2026 had shed 45 basis points to 9.55 percent. On the equities front, banking stocks added another 2.94 percent, bringing the Banks’ Index to 5,966.64. It remains about 9 percent below the levels it had reached before Nene’s shock sacking last week. The banking rally helped pull the benchmark Top-40 Index up 0.66 percent to 43,701 while the wider All-share index added 0.72 percent to 48,429. Trade was robust with around 322 million shares changing hands. JOHANNESBURG (Reuters) – South Africa’s rand strengthened more than 4 percent in early trade on Monday after President Jacob Zuma named widely-respected Pravin Gordhan as finance minister in a bid to draw a line under days of market turmoil. Zuma gave Gordhan the job late on Sunday, in a dramatic U-turn that gave Africa’s most industrialised economy its third finance minister in a week. Just four days earlier, the president had sacked Nhlanhla Nene as finance minister and given the job to David van Rooyen, a relatively unknown lawmaker and Zuma loyalist – a move that had triggered a wave of criticism and a sell-off on the markets. 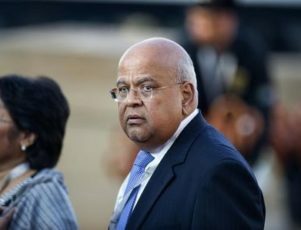 Gordhan, who last held the post from 2009 to 2014, was due to address the media at 1pm local time (1100 GMT), a statement from the Treasury said. South Africa is gearing up for local elections next year where the ruling African National Congress (ANC), is expected to face stiff competition from the opposition Democratic Alliance in urban areas, including the economic hub of Johannesburg. The countryside remains an ANC stronghold. Even some supporters of the ANC, Nelson Mandela’s erstwhile liberation movement that has ruled since the end of apartheid in 1994, expressed dismay about Wednesday’s appointment of a Zuma loyalist to the crucial post. They also described his latest appointment as a sign Zuma was losing control. “It may not be his death knell, but it’s certainly the turning of the tide,” a former senior anti-apartheid activist and ruling ANC legislator Ben Turok. The currency fell nearly 9 percent last week following the removal of Nene, a civil servant veteran who was keen to rein in government spending. By 0716 GMT, the rand had strengthened 4.53 percent against the dollar to 15.1700, recouping some losses suffered last week. The rand had traded at 14.4320 per dollar before Nene was fired. Yields on government bonds recovered sharply in early trade, with the benchmark paper due in 2026 down 101 basis points at 9.37 percent. The rally may also be limited if the Federal Reserve, the U.S. central bank, raises interest rates on Wednesday – a move set to put emerging markets like South Africa under strain. “Markets should rally back very strongly but I would not expect a total retracement with a permanent loss of trust in leadership even if we are in a better place,” said Peter Attard Montalto of Nomura in London. The removal of Nene also led to a selling frenzy in South African banking stocks, which dropped nearly 20 percent on investor worries that the country’s credit rating would slip into “junk” status. On the bourse, the banking index shot up 12 percent, having dropped nearly 20 percent after Nene was removed. The Johannesburg Security Exchange’s broad All-Share index was up 2 percent to 49,051 points by 0734 GMT. Zuma said the about-face decision was prompted by many calls to rethink his decision. South Africa’s Beeld newspaper, citing an informed person, said Gordhan’s appointment was preceded by a crisis meeting between Zuma, politicians and representatives of the private sector on Sunday afternoon.